As soon as your child gets his/her first teeth, around 3 to16 months, it is a good idea to begin thinking about early dental care! Begin by gently brushing or rubbing their teeth with a very soft bristle brush designed for infants; it is not recommended to use toothpaste on infants until they are able to spit it out. 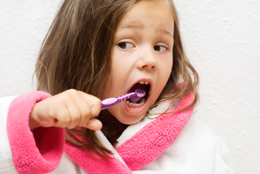 Brushing should be done at least once a day for them and is usually best at bedtime. One of the easiest ways for a child to get decay is by going to sleep with a bottle or sippie cup filled with milk or juice, although milk and natural juices are very good for a child’s health, the sugars found in both can cause decay if they are allowed to stay on your child’s teeth for a long period of time, such as overnight or long naps. Starting a toddler into the habit of water only in a sippie cup or bottle at bedtime is a good beginning with avoiding early decay. Other causes of decay can be found in too many sweets such as candy, fruit chew snacks, and other gummy snacks. Even though some may consider the small snack size fruit chews as healthy, if left to sit on a child’s teeth without brushing, cavities can easily begin on back teeth where a child chews. 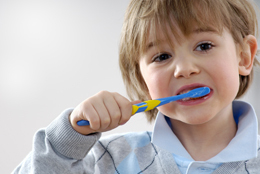 Always encourage your toddler or child to brush before going to bed to brush away the sugar bugs. An early visit to the dentist can help educate you about caring for your child’s teeth and can help prevent cavities. According to the American Academy of Pediatric Dentistry (AAPD) some children as early as 6 months, may need to see a dentist if they have high risk factors such as sleeping with milk or juice, or if stains appear on their teeth. If your child’s teeth seem to be developing normally and you are brushing their teeth twice a day, a dental visit around two years of age is a good time to begin.